"Hacking STEM" was one of the initiatives that Microsoft was heavily promoting at the BETT Show last month. I asked a few Microsoft employees what "hacking STEM" meant. They all replied with explanations that centered on the idea of providing teachers with hands-on STEM lessons and projects that can be done without having to spend much money, if any, on physical materials. One of the many examples that Microsoft had on display to represent their hacking STEM projects was the homemade wave machine pictured in this blog post. You can find directions for that project here (link opens PDF). Microsoft's Hacking STEM Library is divided into activities that take multiple days to complete and activities that can be completed in one day. All of the activities in the Hacking STEM Library include detailed directions, materials lists including places to acquire materials, and lesson objectives. 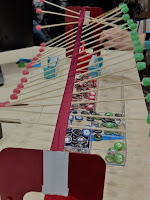 The homemade wave machine project is an example of a one-day project. This lesson on harnessing electricity to communicate is an example of a multiple day project.